Sunshine and Shells Summer Hat Crochet-A-Long!!! Starting June 1st!! Sunshine and Shells Summer Hat CAL… Join the fun!! Week 1 ~ Wednesday June 1st – Pattern Preview, Materials List and Gauge Swatch! Week 2 ~Wednesday June 8th – Top and Crown of Hat! Week 3 ~ Wednesday June 15th – Brim and Shaping! Each Tuesday Evening I will chat live on Facebook about the next days assignment… During the broadcast, you can ask questions and post your progress pictures in the post!! 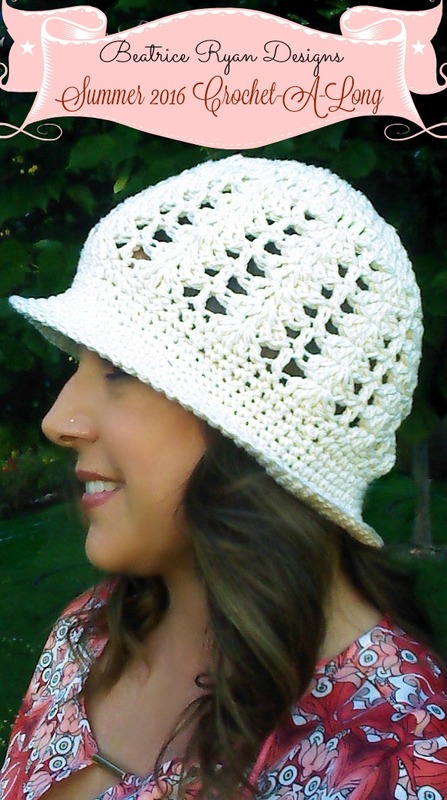 I can’t wait for you to join me and we can all be wearing Beatrice Ryan Designs ~ Sunshine and Shells Summer Hat by the first day of Summer on June 20th!! Join me tonight at 6pm PST for my Live Facebook Broadcast!! I can’t wait to have some fun with you!! I would love to listen and make my first hat, but I am in South Africa, so the time zone makes this impossible. Are your broadcasts uploaded to YouTube, or will there be written instructions posted after the broadcast?